Q. What Steps Are Involved in Filling a Tooth ? First, the dentist will numb the area around the tooth to be worked on with a local anesthetic. Next, a drill, air abrasion instrument or laser will be used to remove the decayed area. The choice of instrument depends on the individual dentist's comfort level, training, and investment in the particular piece of equipment as well as location and extent of the decay. Next, your dentist will probe or test the area during the decay removal process to determine if all the decay has been removed. Once the decay has been removed, your dentist will prepare the space for the filling by cleaning the cavity of bacteria and debris. If the decay is near the root, your dentist may first put in a liner made of glass ionomer, composite resin, or other material to protect the nerve. Generally, after the filling is in, your dentist will finish and polish it. Several additional steps are required for tooth-colored fillings and are as follows. 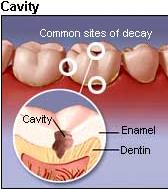 After your dentist has removed the decay and cleaned the area, the tooth-colored material is applied in layers. Next, a special light that "cures" or hardens each layer is applied. When the multilayering process is completed, your dentist will shape the composite material to the desired result, trim off any excess material and polish the final restoration. Today, you can choose from many different kinds of fillings. While each dental filling material has specific characteristics, it may be of some help to be able to compare them based on certain criteria. Types Available : Indirect and Direct. Indirect fillings are made by a lab, and then inserted into the tooth. Direct fillings are hardened in the office with a blue light. Uses : Front and other visible teeth. Composite is also used for inlays. Can also be used for fillings of almost any size. Time Needed to Get Filling : Indirect fillings will require two visits. Direct fillings can be done same day. Filling will match natural tooth colour. Will bond directly to tooth, which helps tooth remain stronger. Less tooth material needs to be removed than for amalgam fillings. Can be used with other materials to improve certain features. Possible shrinkage during the filling process. This can increase risk of tooth cavities later on. Because composite must be filled in layers, process can take longer. May not last as long as amalgam when used for large fillings. Uses : Crown, onlays, and inlays. Time Needed to Get Filling : At least two visits. Durability : Usually longer than 7 years. very durable, and can take chewing force long term. Much more expensive than amalgam. Electric current can be created if gold an amalgam fillings are adjacent to each other. When combined with saliva, this can create a painful shock. Uses : Repairing crowns, and for areas that do not absorb a great deal of chewing pressure. Can also be used for small fillings. Durability : Over 10 years. When improperly installed, can cause damage to gums and tooth pulp. Few dentists now offer gold foil fillings. brittle when compared to composite resin. filling needs to be fairly large in order to prevent breakage. Components : glass and acrylic. Uses : Fillings in front teeth, as well as in roots and around neck of teeth. Can be used when extensive decay is present, as well as for baby teeth. Many dentists also use this filling to cement inlays. Costs about as much as composite resin. Releases fluoride, which helps reduce further tooth decay. Sticks well to tooth, thus reducing leakage and future decay issues. Does not match colour of teeth as well as composite resin. Needs to be applied in thin layers. Crowns, inlays and onlays can be made in the laboratory from dental composites. These materials are similar to those used in direct fillings and are tooth colored. One advantage to indirect composites is that they do not excessively wear opposing teeth. Their strength and durability is not as high as porcelain or metal restorations and they are more prone to wear and discoloration.